The cucumber, one of the oldest cultivated crops, remains popular today thanks to its crisp flavor and its many health benefits, explained below. Cucumber, native to the foot of the Himalayas, began to be cultivated several thousands of years ago. Today, it remains one of the top 20 most important crops worldwide, and it is often used to add a bit of crunch and flavor to sandwiches or salads, but it also provides a myriad of health benefits. Reducing inflammation. Cucumber is commonly used to reduce skin inflammation and can be useful for reducing internal swelling as well. Stimulating urination. 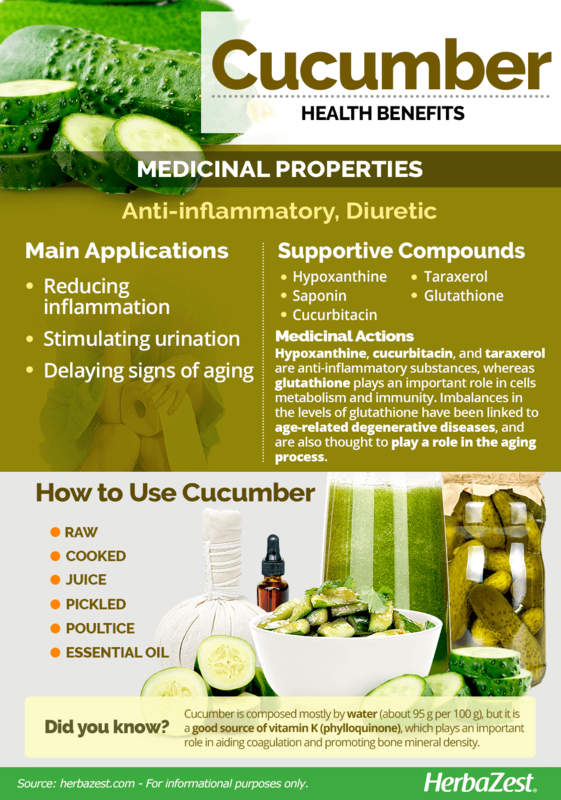 The diuretic properties of cucumber facilitate the elimination of toxins through the urine. Delaying signs of aging. This may be due to their antioxidant compounds, which help prevent the cellular decay related to the aging process. Regulating intestinal processes. 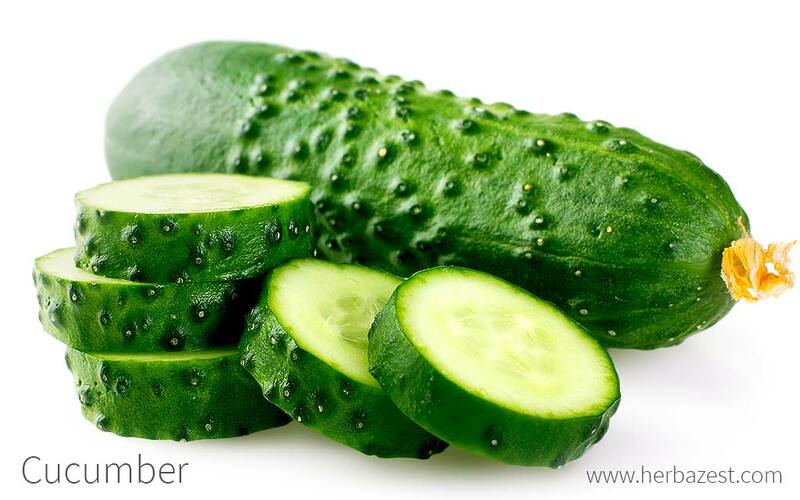 Cucumber has been used to treat dysentery, and its seeds have also been shown to help rid the body of tapeworms. Thanks to the organic compounds hypoxanthine and saponin found in its seeds, the cucumber works as a natural anthelmintic that rids the body of parasites, specifically tapeworms. Hypoxanthine is also an anti-inflammatory substance, as are cucurbitacin and taraxerol, both of which are found in the cucumber as well. Cucumber receives its antioxidant properties mainly from glutathione, which is a tripeptide present in body's tissue and comprised of three amino acids (cysteine, glutamic acid, and glycine). Glutathione plays an important role in a multitude of cellular processes, including cell differentiation, proliferation, and decay. Imbalances in the levels of this antioxidant compound have been linked to a weakened immune system, and are thought to play a role in the aging process, as well as in many age-related degenerative diseases. Anti-inflammatory properties also can be found in herbs like graviola and mallow, while celery and maize have similar diuretic effects. Cucumber is very safe for consumption, and the risk of side effects is low. However, because it is a diuretic, overconsumption may cause a loss of body water and salt, leading to possible dehydration, dizziness, and headache. 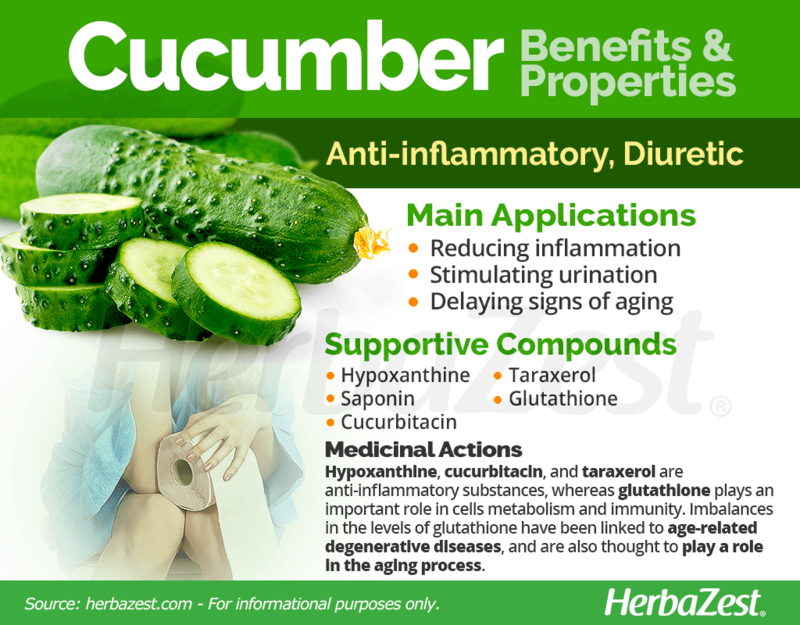 Rarely, cucumbers may interact with medications, especially other diuretics. On the other hand, cucumbers contain salicylates, which are chemicals that occur naturally in many plants and may cause an allergic reaction in some people. Symptoms can range from rhinitis, asthma, and nasal polyposis to urticaria and gut inflammation. On the nutritional side, cucumber is a good source of vitamin K (phylloquinone), which plays an important role in aiding coagulation and promoting bone mineral density. Additionally, cucumber provides reasonable amounts of copper, which works with iron in the production of red blood cells, as well as promoting healthy blood vessels, nerves, bones, and immune system. Vitamin B5 (pantothenic acid), on the other hand, is also present in this crunchy vegetable as a precursor of coenzyme A, which is required for the synthesis of proteins and fats. Cucumber also contains trace amounts of many other vitamins and minerals, all of which contribute to its nutritional benefits. 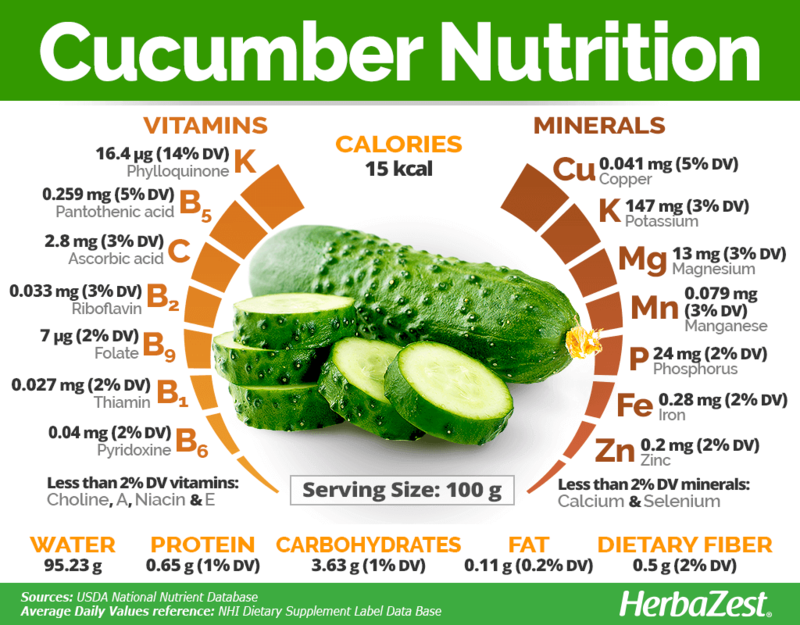 100 grams of cucumber with peel provide 15 calories, zero fats, and 2% of the daily value for dietary fiber. 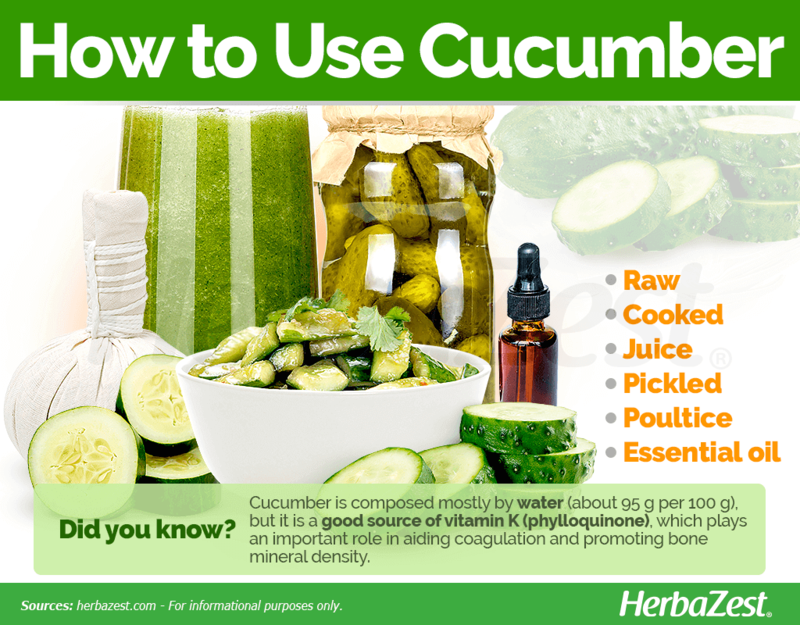 Although cucumber is most commonly used as a culinary ingredient, there are still a few supplemental forms available. Raw. Raw cucumbers are often sliced and added to salads or sandwiches, and they provide all of their health benefits when consumed this way. Cooked. Cooked cucumbers lose a small amount of their nutritional value, but still serve as a common and healthy component of larger dishes. Pickled. Pickles or gherkins are a common preparation of cucumbers, but because the brine used to pickle the cucumbers is high in salt and other additives, pickles are not as healthy as raw or cooked cucumbers. Juiced. Cucumber juice is the least common preparation. It provides many of the health benefits, but due to the removal of pulp when juicing, the anthelmintic properties of the seeds may be reduced. Poultice. Raw cucumber slices can be placed on the skin to reduce inflammation from causes such as acne and sunburn. They can also be placed over the eyelids in order to reduce swelling and puffiness. Oil. Oil extracted from cucumber seeds is a less common but still useful way to reduce skin inflammation; however, using the oil - which should only be applied topically - will not provide the other benefits the cucumber has to offer. Cucumbers are a common plant and can be bought year-round. They are easy to find in their raw form at most supermarkets or grocery stores around the world, and may come pre-sliced as well. Cucumber seed oil is not as ubiquitous, but can be found at online retailers and certain beauty suppliers. Because of its bright flowers and variety of shapes and sizes, cucumber is often grown for ornamental purposes as well as practical ones. It is an annual plant and can be grown both as a vine and a bush. Cultivating a cucumber plant is a fairly simple task, and the plant should flourish with some basic care. Warm, fertile soil with good drainage is the best type of soil for promoting cucumber growth. Cucumbers develop best in soil with a neutral pH (6.5 - 7.5). Light is essential for a growing cucumber, so they should be planted in an area that receives full sunlight. Constant moisture is required as well, but becoming waterlogged will damage a cucumber plant's new growth, so drainage must be adequate. In colder regions, cucumbers should be planted after the last frost, although they can also be planted earlier in pots indoors and transferred outside once the weather has become warm enough. Cucumber seeds or young transferred plants should be planted approximately 12 inches (30 cm) apart. Young cucumbers may be ready for harvest as early as 60 days after planting, but they can be harvested any time up until they turn yellow or their seeds become hard. To promote the best cucumber growth, some new flowers may need to be pinched off to allow the plant to focus its energy on the cucumbers already growing in older flowers. Cucumbers are susceptible to certain pests, such as cucumber beetles, as well as several diseases, notably bacterial wilt, powdery mildew, scab, and cucumber mosaic virus. More detailed information about growing cucumbers can be found in the herb garden section. Cucumber vines can climb up to six feet (2 m), while the bushes take up only two to three square feet (60 - 90 cm2). Leaves are a simple rounded triangle shape, and grow singly around the stem in a helical pattern. The flowers are usually a bright yellow, but may range from orange-yellow to yellow-white. Male flowers grow in groups of three to seven, while female flowers grow singly. Cucumber (Cucumis sativus) is a member of the Cucurbitaceae family, which comprises about more than 100 genera and 990 species of annual or perennial vines, including melon (Cucumis melo), and pumpkin (Cucurbita pepo). Cucumis anguria. This plant is also called the West Indian gherkin, and, along with the pickling variety of C. sativus, is commonly used to make gherkins. Cucumis melo var. conomon. Colloquially named the Asian cucumber, this plant is grown in China and is more closely related to the melon than it is to C. sativus. Cucumis metuliferus. The African horned cucumber is covered in small, dull spikes, and is used more like a fruit than the vegetable-like C. sativus. Cucumber is one of the oldest cultivated plants, native to southwest Asia. Humans began to cultivate it as long ago as the prehistoric era, and historical record indicates that it was a favorite of the ancient Egyptians. Its popularity spread with the Romans, who brought it to the farthest reaches of their empire, and it finally reached the Americas with Spanish explorers, who carried it across the sea. As one of the top 20 most important crops in the world today, cucumber holds a significant economic position. In 2007, global production of cucumber was at 2.5 million hectares, with China's 1.6 million hectares placing them at the top as the largest producer. That same year, the United States imported $548 million USD worth of cucumbers, despite being a large producer themselves. Cucumbers can be used to flavor other foods; several high-end spas and resorts add them to their drinkable water supply for their refreshing flavor, and cucumbers have even been used to flavor ice cream. They may also be used in cosmetics. Cucumber is a widely available and deservedly popular vegetable. Its many health benefits, especially its anti-inflammatory and digestive properties, make it a great addition to nearly any diet.